Peter Brandt is a classical chartist and a trading legend, in the foreign exchange and futures markets since 1975. In this exclusive five-part series, Peter shares his knowledge and the lessons he has learned, to develop a framework to trade successfully with chart-based analysis. 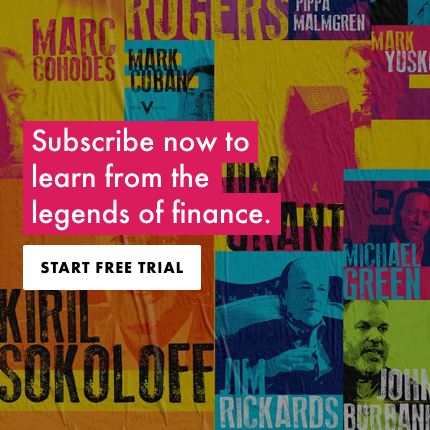 In Episode 1, Peter takes Raoul Pal through his fascinating life story, from how he discovered charts and the importance of risk management, to the mentality of markets and what they can teach you about yourself. This guy is the single best person to follow on the whole of Twitter...I've made some serious money just by following a few of his ideas over the last year. Fantastic to have Peter Brandt, I am solidified in my choice to purchase a Real Vision subscription. Great interview, learned a lot! Many thanks for investing your time to give us this series Peter! A great interview with a smart, seasoned and successful trader. When I watch Real Vision, I always stop to think about the results of the interviewee before I decide how much of their thinking I will take on board. Peter's results are consistently outstanding. Excellent interview, thank you so much Peter for sharing. I actually didn't know who is Peter Brandt before. But here I am, fascinated by this interview, looking forward to the rest videos. Raoul, thanks a lot for brilliant questions. It is crucial for the high quality interview. it is so rare to talk to a successful independent trader. Someone who is our example, the man who walked this painful, difficult path and succeeded. It is obvious how much of self-reflection Peter went through. It is trully a blessing to hear his stories, lessons. He is so genuine and open, no hidden agenda. Peter, thank you so much. Peter and Raoul, thank you for this guys. You add value to the lives of so many people! Peter, I have a question: How is a pattern formed from the point of view of actual people coming in and out of a market? What makes the shoulders lower than the top (for H&S), or higher high and lower low (for Diamond)etc...? How people think and act that produces the patterns? This is something I would love to read about. In other words, Investor A buys to open but Investor B buys to close, then fear/margin call/greed takes over and A/B do something, etc... I look at charts and try to "see" and "feel" people taking decisions in real-time. If I manage to understand HOW patterns are formed and not only that a certain pattern, statistically, is doing this or that, I would be so happy! Thank you again guys, I really appreciate the privilege of you taking the time to share your thoughts with so many people around the world. The best explanation of why patterns form would be from the books "Technical Analysis and Stock Market Trends" by Edwards and Magee (1948) or "Technical Analysis and Stock Market Profits" by Reichard W. Schabacker (1933). I recommend the Schabacker book -- he was the originator of patterns and his book is the easier read of the two. Absolutely fascinating and excellent value. Massive thanks! I'm here to learn. Truly grateful to have a master legendcteach. Thanks Peter! My process is completely different but I really enjoyed this. Love Peter , however we live in a world where all markets are manipulated - they are not organic and have no fundamental or charting ability -- they are the whim of policy. You have to guess what the CB's are going to do and it is just getting worse and worse and worse. I'm only half way through the video and I'm already loving it. Real people, real traders, real experience and wisdom: Real Vision! Infinite Thanks! Even as a long time Factor subscriber, I found myself riveted to the interview. What a humble giant! Kudos RV! Just curious- so has being a Factor subscriber helped you with your trading? Real Vision introduced me to Peter and his service. After Real Vision, it is the best investment I've ever made. Ive traded commodities using charts and risk management mostly (though much much MUCH inferior to Peter, ehm) and it was such a relief to read his work. It is so clear and succinct, which is as rare as a white buffalo in this murky world of charting and risk management. Just like Real Vision, I learn something new every time I open it up. what are the two books again? Another happy Factor member here. Thank you for sharing your fascinating journey, Peter. Well done RV for such an enjoyable interview. Loved seeing the older photos and statements, great touch! Real vision stepping up a level, again. Excellent. Watched it twice just for fun. Loved Peter's response in regard to fundamental traders who don't believe technical analysis works (my paraphrase). Beyond that, great to see Raoul appear to be truly enjoying a conversation. I will echo what others are saying here, when I say this is truly a remarkable interview, which reflects RV at its very best! What I like about this interview in particular is the look-back on the career. There is so much to learn (and admire) when you hear about a person's journey. It is NEVER the case that they were always as notable/prestigious/wise as we see them in their "accomplished" status today. I really think this review of a RV guests' career journey (if they are willing to share!) adds just so much to the listeners appreciation and admiration. This interview really brought that into high relief. Again, RV, job well done! We're standing upon the shoulders of giants. Thank you. A more appropriate expression would be "mining the minds of midgets"
Thanks Raoul for asking two questions I always wanted Peter to answer: (1) have you tried random trades with the same risk management? (2) could an algorithm implement his methodology? If the system is as rigorous as it appears, you have to wonder why there's a need for much personal discretion. Great interview. Looking forward to the rest of the series. Same here. I kinda understand (2) but can't really grapple with (1) - it may even work better than his own 40% (considering 50/50)... perhaps it is about conviction ? Wow! What a rare human who’s only interest is to share his priceless knowledge and wisdom. Real vision and its subscribers are so lucky. I'm getting my moneys worth here RV! Thank you Peter and well done Raoul. Can't wait for the next episode. This is such a great interview! One of the best I have watched. The trading insights are invaluable. Looking forward to the next installment. What a pleasant, knowledgeable and insightful gentleman. Great interview. Thank u for an A+ education Raoul, Peter! Successful trading is one hard job. I am still learning the art of cutting losses short, risk mgmt. I now start small on trades to test my trades. If I am right, I will add on. BTW I enjoyed seeing the pics through the decades-thanks for sharing. Fantastic interview...I feel really blessed to be able to learn from a living legend. New factor member as of just now and having seen the report in Real Vision Publications...I am excited to see the weekly product. Peter is a true self made man in the markets and is a hero to young traders hoping to do the same. Thanks Raoul! Incredible, love you all for such a content!!! I have been a member of his Factor Service since inception.He is superb. He does not sugar coat anything.He is brutally honest,not only with his subscribers but,more importantly,with himself....and yes his returns are staggering! Sulinder, thanks for this intro. I actually didn't know who is Peter Brandt. Peter is a legend and theinterview was just outstanding ! Thank you for bringing him to the RV and giving him the proper credit for his work. Brilliant, what a hugely likeable and admirable guy. Great job RVTV. What an inspiring man. Next week cannot come soon enough! All aspiring traders should read his book, it's one of my top 3 trading books: Diary of a Professional Commodities Trader. what are your other two? What a fascinating interview! Peter is the consummate professional and it truly shows in this interview. He's had a storied career and it was great getting to hear all about it. Raoul did a super job with the interviewing side too! Really looking forward to Peter's charting series that is upcoming! I like the candor , modesty and honesty that Peter brings to RVTV , look forward to his series and some serious brain picking . many thanks to all . I feel humbled by your kind words. Wonderful. As Raoul said, we are blessed to be able to listen to Peter's wisdom.